Angling in the winter is hard enough without the stress of finding the right fishing spot. The good news is that an ice auger can increase your luck by drilling into frozen rivers and lakes to find fish in locations that are safe and comfortable for you to fish in. 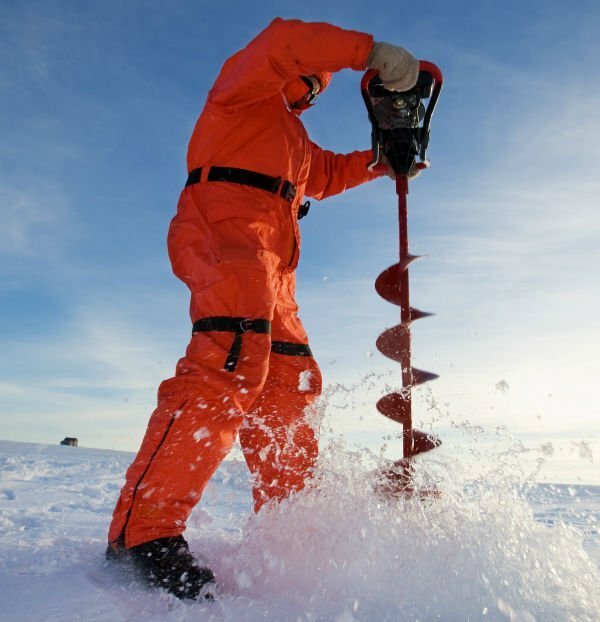 An ice auger is a handheld drill used to make holes in the ice or earth. Anglers use ice augers to drill in frozen lakes to fish. The tool is designed with unique components called cutting spurs that cut out perfect circles effectively. It makes it easier for you to access fish hidden in the icy water, and offer the advantage of cutting different size holes depending on your preferences. Before diving any deeper, here is a quick look at the best ice augers. LANDWORKS Heavy Duty Eco-Friendly Electric Power Cordless Earth Auger 6"
Battery-powered auger produce no smog and is more quiet. Item weighs only 22 Lbs. The ION 19150 is an electric ice auger that offers surprisingly high performance given its price range. It only weighs 21 pounds and is capable of drilling 8” holes in the ice, making it a perfect choice for big fish. Its handlebars are well spaced for comfortable handling and the vibrant lime green color is easy to spot in the snow. This auger works great when drilling in a shanty. It has a Slush-Flushing Reverse feature that automatically flushes all slush from the hole, hence a smoother fishing experience. It is 34 inches long and comes with a 12-inch extension that brings the total length to 46 inches. The battery is long-lasting and can drill 30-40 2" deep holes on a single charge. Eskimo has been building reliable augers for more than 50 years. Their Stingray S33 boasts excellent craftsmanship and every detail is designed and tested to ensure peak performance. It is equipped with a 2-cycle 33cc Viper engine that gives you the precise power you need. The all-metal ball-bearing transmissions combined with quantum or rocker bits help convert the power into smooth yet fast cutting. Getting the tool started is easy thanks to the oversized mitten grip handles. The wide-wing tubular handle is covered with foam and has a fingerpoint throttle for maximum control. The large plastic handle can accommodate your hands without requiring you to take off the gloves or mittens. As such, you can stay warm while drilling into the ice. The Xtreme power US is a gas-powered ice auger that lives up to its name with a powerful 55cc engine. It uses gas and oil and offers up to 280 RPM bit speed thus ensuring quick and efficient cutting. The auger comes with an 8-inch drill bit for optimal cutting capacity. It has a manual recoil easy start fuel delivery system that guarantees quick starting ability. The translucent fuel tank makes it easy to keep track of the fuel levels and has a 0.98-liter capacity. This posthole digger also works with augers from 6" to 10" in diameter for increased versatility. It has anti-vibration foam grip handles that reduce fatigue when working and finger throttle for optimal control. The XtremepowerUS V-Type 55cc is a gas-powered motorized digger that comes with a 2-cycle air cooled engine. It has a 55cc displacement and is quite powerful with a whopping 1090W rated output. It is easy to start and has a compact, lightweight design that makes it perfect for those who move around a lot. The best thing about this auger is that it comes in different variations, so you can choose something that works for you. Additionally, it can be used for more than just drilling in ice. It is an excellent tool for installing fence posts, planting trees and more. The bits can dig holes up to 2.5 feet deep and 6” bit comes handy when fishing for the smaller species. The Southland SEA438 boasts a 43cc, 2-cycle, full crankshaft engine. It works great in a variety of situations and environments, making dozens of holes in an hour. It comes with a manual recoil easy recoil easy start fuel delivery system and a fully loaded tank can last you a few days. The large butterfly handles with rubber grips minimize hand fatigue when working. They are also detachable to ensure convenient storage and better handling. This one-man earth auger has direct gear with a solid steel drive shaft and a gas powerhead. The 8" auger bit drills a hole up to 13 feet deep at high speeds of 316 RPM. Like other augers by Southland, this one sports a translucent tank to help you keep track of the fuel levels. The Strikemaster Mora Blade Hand Auger guarantees easier drilling with high alloy carbon steel blades. It is powder coated to minimize ice buildup. Customers fell in love with the handle because it can be adjusted to 48-57 inches to suit taller anglers. At just six pounds total weight, carrying this hand auger around will prove an easy task. The handle system with designed with an emphasis on ergonomics and includes soft rubber grips for extreme comfort. There are multiple blade sizes to choose from depending on the intended purpose. Even though drilling through the ice with a hand auger can be difficult, this particular model is specially engineered to give you increased control and comfort. The Strikemaster Lazer is another hand auger that will surprise you by how quickly it puts holes in the ice. It boasts powder coating paint to reduce ice buildup and chrome alloy stainless steel blades for efficient drilling. 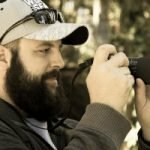 It is an excellent tool for someone who needs to pack light, probably for a hike to your favorite fishing spot or charter flight to a remote location. The handle is ergonomically designed and features rubber grips for comfortable handling. It is also adjustable from 48 to 57 inches to suit different angler heights and ice thicknesses. Depending on your needs, there are four different blade sizes to choose from including 5”, 6”, 7” and 8”. The HT Polar Fire Deluxe Hand Auger is designed to eliminate the frustrations of heavy and clunky augers with sticky mechanisms. It uses premium extra-sharp chromium curved blades for optimal cutting efficiency. It is provided with an all-metal skimmer 18” handle that minimizes hand fatigue as well as a 6” rimmed cup. There are three different height adjustment settings for various angler heights ice thicknesses. The Eskimo Hand Ice Auger is a budget-friendly auger for those who don't have a lot of money to spend. It comes in 6", 7" and 8" blade sizes. It has a simple entry-level design but offers high-grade performance consistently. The sharp blades can dig more than 15" deep holes in the ice and have a plastic cap for protection when not in use. The pommel handle has rubber grips and is designed to provide maximum comfort. It can be adjusted from 49 to 58 inches and the auger can be broken down for easy transportation. An ice auger can be operated manually, powered by electric battery or utilize an internal gasoline combustion engine connected to a tractor. 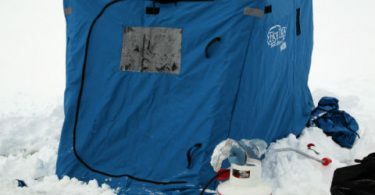 Using the right type of auger is crucial to enjoying a hassle-free ice fishing expedition, and all of the above offer unique advantages and disadvantages. These feature a basic design and remain popular among many anglers, despite the increased popularity of electric and gas powered models. Strong arms and shoulders are a must if drilling holes into ice with a manual auger. If you intend to drill through thin lakes and ponds or don't fish often, a manual ice auger is worth considering. Its main advantage over the other types is that with such a simple design, the risk of breaking down is minimal. Most experienced anglers prefer electric ice augers as they offer several advantages over manual and gas augers. They have a lot of power and make drilling through thick layers of ice very easy. The fact that they run on electricity means that they are easy on the environment, produce fewer fumes or oils and much quieter. The main disadvantage of electric augers is that once the battery life gets too low, performance deteriorates drastically. Anyone looking for the fastest way to drill through thick ice should certainly consider a gas-powered ice auger. It drills holes through ice like a knife cuts through butter. While more likely to break down compared to manual augers, it offers more efficiency and reliability. You have the option of choosing between two-stroke and four-stroke engines. The two-stroke engine makes sense if you intend to do a lot of drilling in thick ice while four-strong motors are best for heavy-duty ice drilling. One of the most important factors to take into consideration when choosing an ice auger is the weight. Power augers are about four times heavier than hand augers, giving the latter a considerable advantage. A manual auger is your best bet if you plan on drilling in remote locations because you don’t have to worry about low battery levels. Electric augers are available in heavier and lightweight varieties depending on the size. Choosing the right blade size is also a crucial aspect of identifying the best auger for you. Most companies offer a variety of sizes usually 6”, 8” and 10”. Using a 10” blade is best recommended for larger species like burbot, pike and lake trout. The 6” and 8” augers are a good choice for someone who wants a minimal upscale in price. Whatever your preference, make sure that the blade can drill holes big enough to fit the fish through when you’ve caught them. Ice auger blades also come in different shapes. Solid options include serrated blades and pivot-tip or power-point blades "always make sure your auger blades are sharp". You can also opt for single, double or four blades, and the latter provides the fastest cutting speed. If you are leaning towards a powered ice auger, you should consider the fuel technology. There are a few options, with Jiffy Ice Augers having cornered the market in that area. They provide innovative fuels options that are gradually replacing 2-stroke engines, which run on a mixture oil and gas. While they do run well, 2-stroke motors are high maintenance. In addition, they can be difficult to start if oil and gas aren’t mixed properly. Many manufacturers are shifting towards 4-stroke engines as they are easier to operate and maintain. Regardless of what they are powered with, ice augers are very noisy and this can scare away the fish before you start fishing. Electric augers produce the least noise if used within a shanty. On the other hand, gas augers are noisy and not safe to use in closed shacks as they emit hazardous fumes.